The Pony Club Polocrosse Home International returned for the second time in 2017 and once again the event was hosted by Celyn Polocrosse Club. It was held alongside their club tournament at their Backford grounds on the 22nd and 23rd of July. The event served as another great display of the young polocrosse talent that exists within the UK Pony Club across all four nations and that will be feeding through into the UKPA’s (and potentially the Irish Polocrosse Association’s) own teams in future years. Players ranged from 9 to 22 years of age across the three age groups; Seniors (Under 25), Juniors (Under 16) and Minis (Under 13). The Home International has an individual trophy for each age group and then an overall trophy, where the scores of all three sections are combined to create an overall match result between the Nations. 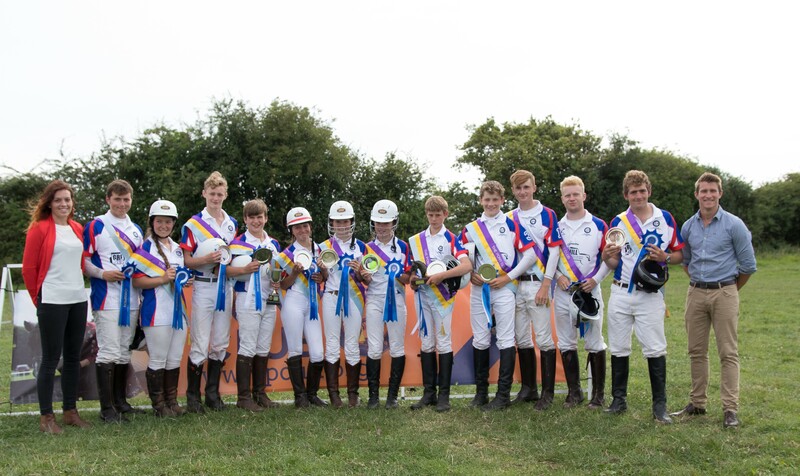 England overcame a strong Wales team to lift the overall Triple Diamond Trophy for the second time but they had to rely on the strength of their juniors, after Wales won both the Scott Senior Trophy and the Kimber-Tarbuck Mini Trophy. In the NVable Junior Trophy, England’s junior players were brilliant, as they retained the trophy they had won in 2015 and also were a very big influence on the overall result. The England team featured three of the UKPA’s own Under 16 team in Hugh Ralli, Josh Smith and Theo Cornforth (who all flew off to the states to play the USA the next day) plus the very talented Fin Bristow, who had himself turned down a place on the UKPA Under 16 team. They were all mounted on some very impressive horse power and won all three of their matches easily, conceding only two goals throughout the tournament. The other Junior sections battled hard; Wales and Northern Ireland also had members of the UKPA Under 16’s final team and the wider squad in their sections but they could not equal the four English boys, who also benefited from the fact that they came from only two Pony Club Branches and so there was a great deal of familiarity between the players. Theo and Fin have played together for years for the North Warwickshire Branch and likewise Hugh and Josh of the Ledbury Branch. The four English horses, Kelly, Mancha, Ingle and Chuna, have all played A grade polocrosse in their own careers and, combined with their jockeys, they were just too much for the other nations. Scotland’s juniors had the toughest time of anyone, their junior team was relatively inexperienced (compared with the 2015 Scotland junior team, when they finished second), with most of the Scottish players only having a few years playing experience and none of them had played at the levels of some of the players in the other three teams. However, Scotland fought hard all weekend, never gave up and went away from the weekend with a huge amount of valuable experience that will help them and their nation in the future. In the Minis competition, which was kindly sponsored by the Fynn Family, it was Wales who got the win, defeating England by just one goal in their match on Sunday afternoon, after both sections had beaten Northern Ireland and Scotland on the Saturday. England had a completely unchanged team from 2015, when they also finished second. In 2015 England were fielding a team of four 10 year olds and two years later that same team were two years older and were keen to get revenge on Wales, who also beat them in 2015. However, despite on paper probably being the narrow favourites England couldn’t quite overcome a Welsh team, who had three new faces in Charlie Evans, Katy Davies and Will Holland playing alongside Philip Watney, who also played in 2015. Scotland and Northern Ireland also fought out a very tough match on Sunday morning which Scotland ultimately won to finish third, with Northern Ireland fourth. In the Scott Open competition the reigning holders were Northern Ireland but they could not retain their crown as they lost to Wales on the opening day, after Wales’ senior section (comprising of Jack Brown, Alex Brown, Sophia Harpin and Jemma Alderson), put in a seven goal final chukka to turn a three goal deficit into a four goal win. Northern Ireland then did manage to beat England on Saturday afternoon and Scotland on Sunday morning to finish second but it was Wales who emerged as champions as they beat the English seniors on Sunday afternoon in a hard fought match to get their first ever win at this level and put England down to third place. Scotland were probably disappointed to finish fourth in the seniors, after they finished second in 2015 and had hoped for more in the seniors. However, the senior competition was very close throughout and all the victories and defeats were by narrow margins. Overall, it was a brilliant two days of competition and a huge amount of credit should go to the Pony Club, all the team trainers and managers and Celyn Polocrosse club for all their efforts in putting on the event and giving the opportunity for players across all four nations to have a chance to gain such valuable experience and develop their skills further. The teams benefited from sponsorship from Greyhills 4X4 (England sponsors), NVable (Scotland sponsors), Trace Heating Projects (Northern Ireland sponsors), Waterco consultants (Wales sponsors) and Polocrosse Extreme, who sponsored all four teams.